JULY 20, 2016 -- One of the challenges of the 2015 pipeline oil spill near Santa Barbara, California, was distinguishing between oil released from the pipeline and oil released naturally from the many seeps in the area. This challenge could become even more complicated when you consider the history of oil drilling in southern California [PDF] that dates back to the 1860s. 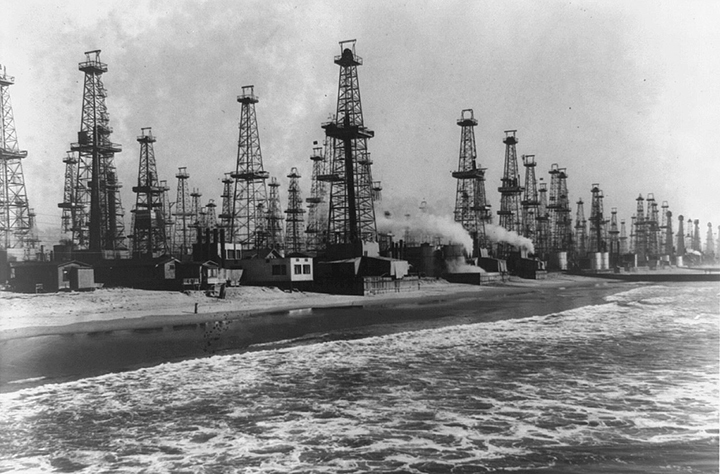 Unless you are a history buff or study environmental pollution, you probably didn't realize that the beautiful sand beaches of southern California were once home to some of the earliest offshore oil rigs. Oil seeps both on the shore and in the ocean were clues to the underground oil reservoirs in the Santa Barbara Channel. Even today, natural seeps in Santa Barbara's Coal Oil Point area release an estimated 6,500-7,000 gallons of oil per day (Lorenson et al., 2011). The first offshore wells in the United States were drilled in 1896 in the Summerland region just east of Santa Barbara. Initial wells were built on piers sticking several hundred feet out into the ocean. Over the years, many more wells and offshore platforms were built in the region. However, oil exploration and drilling was virtually unregulated at the time, and spills were common. 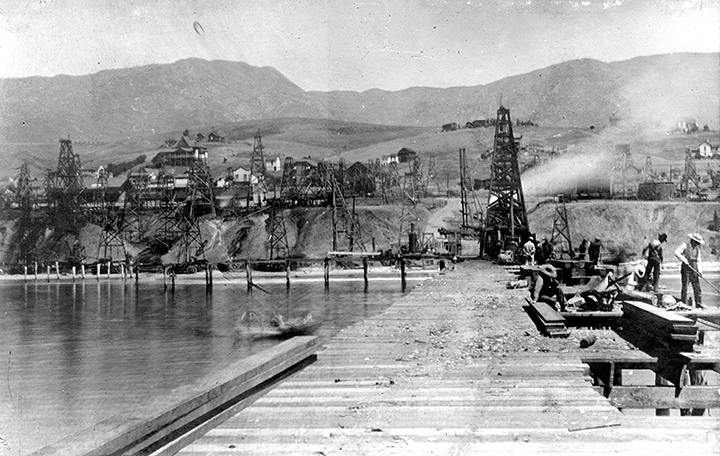 California's first out-of-control oil gusher occurred in February 1892 near Santa Paula, but since no one had a way to store so much oil (1,500 barrels were released per day), much of it eventually flowed into the ocean via the Santa Clara River. 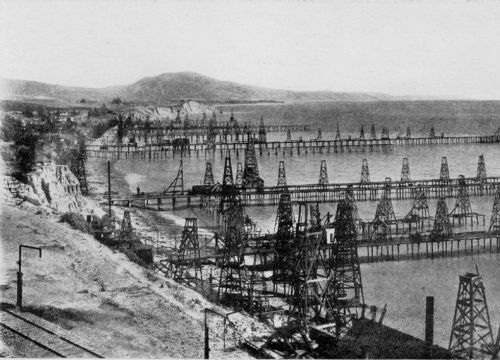 In addition, many of these first flimsy piers and oil platforms at Summerland were destroyed by storms or fires or later abandoned without much thought about preventing spills in the future. The state's first laws governing oil well abandonment came into place in 1915, in part to protect the oil and gas wells on neighboring properties. (Fortunately, the old and leaky Summerland wells were far enough away from the 2015 pipeline spill location that they didn't add yet another possible source of oil in the area of the spill.) By the 1960s offshore oil production began to take off in California, particularly along Santa Barbara County. That is, until January 1969, when Union Oil's Platform A suffered a blowout six miles off the coast. The result was more than 3.2 million gallons of crude oil were released into the Santa Barbara Channel and on surrounding shorelines. Public outcry was so great that not only did California ban new leases for offshore drilling in state-owned waters, but it helped catalyze a broader movement to protect the environment and prevent pollution in the United States. Still, natural seeps serve as a reminder of the area's "Wild West" days of oil exploration. Today, the region is much cleaner, but, as we saw after the 2015 pipeline spill at Refugio State Beach near Santa Barbara, that doesn’t mean it’s free of oil, either naturally released or spilled during extraction. While telling the two apart can be complicated, it isn’t impossible. One clue for distinguishing seep oil from oil coming from production platforms is looking at how "weathered" the oil is. Oil being drilled by a platform is extracted directly from a deep underground reservoir and thus appears "fresher," that is, less weathered by environmental processes. The seep oil, on the other hand, generally appears more weathered, having migrated up through the seafloor and ocean depths. Seep oil is more weathered because many of its less stable compounds have been dissolved into the water column, oxidized by sunlight or evaporated into the atmosphere at the surface, or broken down by microbes that naturally metabolize hydrocarbon molecules. Another method for distinguishing among oils is a process known as "fingerprinting," which uses analytical chemistry to compare the relative quantities of hydrocarbons unique to petroleum in the spilled oil versus another oil. Even though seeps release a lot of oil into the ocean, oil spills such as the 2015 pipeline spill near Santa Barbara have different and more significant impacts on the nearshore environment than the slower, steadier release of natural oil seeps. Spills often release relatively large volumes of oil suddenly into an area, which can overwhelm the ability of the environment (such as its oil-eating microbes) to adapt to the influx of oil. That doesn't mean seeps don’t have any environmental impacts themselves. Oil from seeps can be toxic to marine life, including fish, sea stars, shrimp, and seabirds, with impacts largely concentrated in the immediate area around a seep. While our job is to use science to minimize and evaluate potential environmental impacts during oil spills (and not seeps), knowing the history of an area like Santa Barbara can go a long way to helping us do just that.